We perform a variety of meta-analyses for academic, regulatory, and international clients. Each presents a different set of challenges regarding study design and outcome measurement. We have found CMA to be invaluable in this work. The ability of the software to capture a variety of data elements (study design, multiple outcomes, covariates/confounders) and present details of computations is important in the credibility of our work. The ease of use and ability to produce graphics in a variety of formats aids in preparation of the report. In many instances, we are required to replicate the results of CMA in another package (e.g., SAS). We have always found the support staff at CMA very helpful in these replications and the results of CMA have been replicated in every instance. CMA is a great tool in the scientific credibility of our meta analytic studies. Comprehensive Meta-Analysis is a fabulous program for research synthesis, combining ease of use with advanced features not available in standard statistical packages or competing stand-alone products. The program is ideal for independent analysis or reanalyzing data from another published review (including Cochrane reviews) to explore subgroups, moderator variables, and clinically relevant measures of effect size. Forest and funnel plots can be easily created and customized for publication-quality graphics. As editor in chief of Otolaryngology – Head and Neck Surgery I find the program indispensable for preparing a quarterly installment, The Cochrane Corner, which highlights a relevant Cochrane review and provides expert commentary to aid clinicians in applying and understanding the results. I strongly recommend this program to novice and experienced meta-analysts alike. As a behavioral scientist who is newly developing expertise in using meta-analysis, I have found CMA to be an invaluable tool. It is user-friendly, but avoids superficiality and provides me with all the necessary technical depth I need. I have found CMA to be an outstanding program. The program in Comparative Effectiveness and Outcomes Research at Duke University conducts multiple systematic reviews and meta-analyses each year for professional organizations as well as under both federal and industry sponsored research initiatives. While we use various programs tailored for specific individual projects including those developed in-house, we have found Comprehensive Meta-Analysis (CMA) to be a very facile, adaptable and yet comprehensive package meeting the needs for much of our research and generating publication quality graphics. My confidence in the analytic algorithms is buoyed by my knowledge of several of the developers of CMA and based on extensive comparison of results with other algorithms including our own. 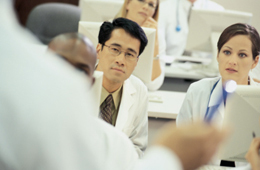 CMA is also an exceptional educational tool and universally embraced by trainees and young investigators initiating careers in evidence-based medicine and statistical analysis. The meta-analysis program is easy to use and provides me with information that would be hard to get by any other means. I analyze a lot of data and, believe it or not, use the meta-analysis program every day. I am not a statistician, but the results I produce have routinely been verified by statistical consultants costing large amounts for their confirmatory analyses. Without verification, I have used the results to make important decisions regarding a potential billion dollar a year product. At night I wonder, “What would I have done without this great program. We bought the CMA software for professional perpetual version at the beginning of this year, and we have used it to do meta-analyses for several studies and trained the postgraduate students already. The friendly spreadsheet, easy-understandable dialog, not programming and modifiable output style make use of the software to do a meta-analysis convenient. The most fabulous point is that it can extend the traditional comparison of two groups to estimation of effect size in one group and generic point estimates. In summary, this software is an efficient and user-friendly tool for scientists to do a study related to meta-analysis. CMA makes the complicated easy. I use it in my research, but in fact I've also used it in the clinic, to summarize evidence for treatment decisions. Comprehensive Meta-Analysis is an indispensable tool for efficient problem solving in meta-analyses. Regardless of whether or not you are a statistician, the software leads you to the world of meta-analysis quickly. Comprehensive Meta-Analysis is extremely easy to use and understand and it is a terrific product. I have now used Comprehensive Meta-Analysis in five meta-analyses and highly recommend it. Its structure and accompanying resources particularly assist researchers with clinical rather than statistical backgrounds to avoid important errors in data entry and analysis. Comprehensive Meta-Analysis enables meta-analysis methods recommended by leading statisticians and meta-analysts to be used by researchers internationally. I have used the Comprehensive Meta-Analysis for the past 6 years in my research activities. It has become a part of my research life. I use it for literature review, compare and contrast differences in findings, and search for insight in empirical studies. The Comprehensive Meta-Analysis helps me enhance my research productivity, efficiency, and quality. Donna F. Stroup, PhD, MSc, Data for Solutions, Inc.
Comprehensive Meta-Analysis (CMA) is one of those rare tools in the research arsenal that does what it is purports to and makes both the process and output understandable. I have used CMA for 7 years in my own meta analytic work and in EBP workshops and courses. The ease of learning the program application and the resulting output make for a wonderful data analysis and learning tool. CMA is an incredible software package for the novice and experienced researcher alike. It offers a sophisticated array of analytical techniques, yet retains the flexibility to adapt to your specific application. The interface is intuitive and user-friendly, and frees the user to focus on the analysis rather than the software. I use CMA in my graduate biostatistics course and recommend it to all of my faculty colleagues as well. The software is a joy to use! Comprehensive Meta-Analysis is a gem. Students are able to return to our computer lab to complete a meta-analysis assignment independently after an initial faculty demonstration session. The software facilitates application of complex concepts with real data, helping students see the power of the meta-analysis process. Comprehensive Meta-Analysis software is like a magic wand. The simple and clear interface (like an Excel sheet) will guide you to do complicated meta-analysis within only a few clicks. The comprehensive formats included in the software allow researchers to input the data through different ways. It provides clear outputs and high-resolution graphs which can be imported to Microsoft Word. I especially love the feature that it shows you the calculation steps so you can check whether you run it correctly. It also provides advanced sub-group analysis, moderation analysis, meta-regression, and publication bias analysis. This software is a lifesaver! Meta-analysis becomes very easy with the help of the Comprehensive Meta-Analysis. I am sure I will use this software for upcoming meta-analyses in the future. Thank you for developing Comprehensive Meta-Analysis. It is by far the best tool available for today’s meta-analytic researcher. It provides flexibility for all possible types of data, it produces great colorful graphical displays, and the product support is unmatched! I have used a number of different programs for conducting meta-analytic research over the last ten years, and CMA is the only product I recommend to my students and colleagues. I recently taught an introduction to meta-analysis course to graduate students from diverse disciplines including ecology, kinesiology, economics, forestry, veterinary medicine, family studies, and plant pathology. I planned to use another meta-analysis software package, but learned about CMA one week before the first day of class. Given the variety of options available in CMA, I thought that CMA might be a better fit for my class. In one week, Michael Borenstein sent me the necessary supplementary materials to prepare me for including CMA in the course. CMA is very intuitive and easily accessible for broad meta-analytic applications. Any questions about CMA were quickly and thoroughly answered. Moreover, the supporting textbook associated with CMA is a must have resource for anyone interested in meta-analysis as it easily explains complicated analytical concepts. In short, CMA is a great software package for meta-analysis. I will use CMA again the next time I teach my introduction to meta-analysis course. I have used Comprehensive Meta-analysis as the primary course software for a doctoral level course on systematic review and meta-analysis methods which I have taught at Columbia University. The software, documentation, and tutorial materials have made the teaching and learning of meta-analysis methods stimulating, efficient, and enjoyable. While the methods of meta-analysis can be daunting to students, this program and supporting materials provide clear guidance and hands-on experience which greatly enrich the learning process. Based on my experience I think that Comprehensive Meta-analysis should be required in any course dealing with the subject. I have used comprehensive meta-analysis since I was a student and it has been the basis for dozens of meta-analysis publications since then. The strengths of the software include its intuitive approaches to statistical issues, its ease of use, and its clear presentation of the data. Journals appreciate that important changes in figures can be made rapidly and clearly. This has also been an excellent tool for teaching students and colleagues about conducting meta-analysis and students enjoy the clarity of presentation and ease of use. With all the ease of use, it is important to note that the software allows a variety of statistical approaches that may be difficult to implement in other software, from choices of meta-regression effects to presentations of heterogeneity. For my group, this software is indispensable. The program is a perfect companion of Borenstein et al's book since it allowed my students to try the concepts discussed in the book. We have done most of the computations by hand first and then checked our answers with CMA. This gave the students 'a feel' for meta-analysis and made them realise that the method is not just about feeding some abstract numbers into a black box and getting a meaningless number at the end. Instead, using the book and the program together the students learned the maths behind the computations and the meaning of the final results. I found the help manual especially user-friendly and ready for classroom use. My students were able to get most of the exercises done at home such that we had the time to discuss the answers and their implications in class. I was interested in to learn how to do a systematic review and meta-analyze. I´ve done several courses but couldn´t evolve to a complete analysis due to the limitations of available software. Then I became aware of “Comprehensive meta analysis”. The program is very intuitive and the book “Introduction to Meta-Analysis” is the most objective I've ever read in this topic. I have recommended those interested in starting training in systematic review that begins by these book and software. Comprehensive Meta Analysis is a powerful computer program for meta-analysis. The program combines ease of use with a wide array of computational options and sophisticated graphics.